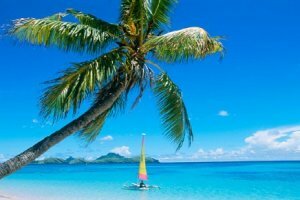 The Fiji Islands are comprised of over 332 islands which lie in the heart of the tropical South Pacific. The country of Fiji also features 2 large islands, Viti Levu and Vanua Levu, where the majority of the population live, as well as the major shopping and commercial city of Nadi and capital city of Suva are. With a warm climate, luxuriant rainforests, beautiful beaches, coral reefs and a thriving eco-wildlife, the Fiji Islands are an ideal holiday destination for families, singles, couples, honeymooners, groups of friends and backpackers to indulge, relax, holiday while experience a unique culture. Outlined below are the Fijian islands that are popular with holiday makers because of the hotel and resort accommodation that is on these islands. Furthermore, as Denarau Island is located no more than twenty minutes away from Nadi International Airport, and is connected to the main Island of Viti Levu via a causeway, Denarau Island is easily accessible, and a perfect destination to indulge in the serenity, cultural experiences, holiday activities and attractions that this tropical paradise has to offer. Fiji is made of of 2 major islands as well as hundreds of smaller islands. 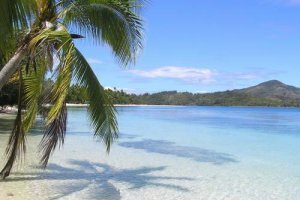 Vanua Levu Island is the second of the major islands and is just a short one hour flight from the Nadi airport on the main island. There are not as many tourists or holidays makers on Vanua Levu Island, which makes it the ideal place to explore the culture and natural beauty that Fiji is famous for. All across the idland of Vanua Levu there are many National Parks and nature reserves that are full of tropical rainforests, spectacular waterfalls, an abundance of wildlife and some truly breathtaking scenery. The Malolo Island is the largest island in the Mamanuca Group of islands. It is ideally situated off the western coast of Viti Levu, just 25kms from the Nadi International Airport. Malolo Island can be easily reached either by sea place or by boat from Denarau Marina. Malolo Island is an 800 hectare tropical island that is surrounded by a numerous outer coral reefs, which not only provides safe swimming beaches but also an abunance of marine life within the reef itself. This south seas island paradise includes the Malolo Lailai island which lies across a channel and provides holiday makers with a number of luxury resorts and recreational activities. Robinson Crusoe Island is a small Fijian island that is located off the south west coast of Viti Levu. It's location places it a 2 hour drive from the Nadi International airport and then the boat trip out to the island provides another trully remarkable Fiji experience. The Robinson Crusoe Island has a range of budget accommodation available, which makes it ideal for smal groups looking for a relaxing getaway or backpackers who want the benefits of an island resort without the huge price tag. Tokoriki Island provides holiday makers with the quintessential Fijian holiday experience. It is a tropical island that is ideally positioned within the Mamanuca Islands of Fiji. Tokoriki Island is home to 2 different resorts which provide a range of accommodation options to suits all travellers. 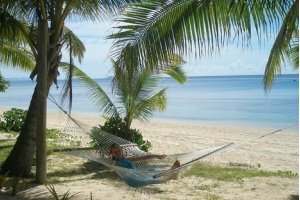 As well as being a great place in which to sit back and enjoy the South Pacific sun Tokoriki Island is also a place with lots of things to see and do. For example you can snorkel at the island's own coral reef, experience scuba diving, go on island cruises, fishing tours and much more. Mana Island is another one of Fiji's smaller islands which is renowned for its spectacular coral reefs, white sandy beaches and eco-wildlife. 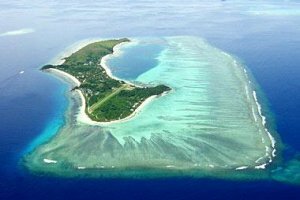 It is one of the Mamanuca Islands, situated in the South Pacific, approximately 30kms west of Nadi. Mana Island is secluded from the main island and can either be accessed by boat or plane. Mana Island is particularly famous for the abundance and diversity of tropical fish, turtles, mantra rays and coral in the reef that encircles the entire Island. Accordingly, it is a great place to partake in activities like scuba diving, snorkelling and swimming and indulge in other fun and exciting activities like parasailing, banana boat rides, fishing trips, sail boarding and cruises to different surrounding islands. 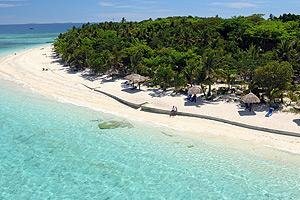 Treasure Island is one of Fiji's Mamanuca Islands and ideally positioned less than twenty kms away from the Nadi Airport. Located on a marine sanctuary, in the tropical South Pacific, Treasure Island is famous for its breathtaking coral reef and luxuriant vegetation and white sand beaches. With over twenty different species of fish such as angel fish and colourful parrotfish as well as tropical coral, Treasure Island is an ideal place to experience Fiji's natural beauties and partake in water sport activities like swimming, snorkelling and scuba diving, kayaking, swimming, catamaraning, wind surfing and motorised sports. Only 6 hectares in size, Treasure Island was established in 1972 and is today owned by a local Fijian family group, the Nakelo Clan. A fabulous island resort that encompasses almost the entire island. The strong influence of the Nakelo Clan ensures a truly authentic Fijian experience on Treasure Island. The Beachcomber Island is another one of Fiji's iconic Islands, situated in the Fijian Mamanuca Islands and accessed via 30 minute to an hour boat ride from Nadi International Airport. Engulfed with white, sandy beaches, lush palm trees and colourful coral reef, and filled with fun packed holiday activities including swimming, snorkelling, scuba diving, water skiing and fishing, Beachcomber is an ideal destination for couples, honey mooners and families, to relax, unwind and enjoy Fiji's natural beauties and great tropical climate. 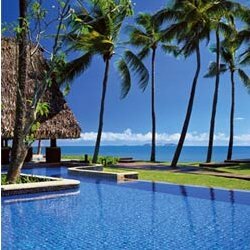 The Bounty Island is a unique island resort destination that is ideal for budget conscious travellers to Fiji. This idealic island is located in the Mamanuca island group of Fiji and is only 15 minutes from the Nadi International airport. The Bounty Island is surrounded by a marine reserve which means that there is a huge variety of fish around the island making it perfect for snorkeling. The island is ringed by white, sandy beaches and includes a number of free activities for its guests including fish and turtle feeding, canoeing, kayaking, bush walks, volleyball, table tennis, pool table and swimming in the pool or crystal clear waters of the South Pacific. 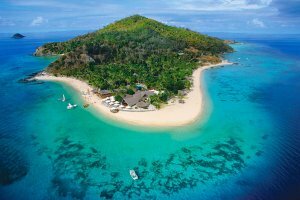 With a luxury resort that provides excellent accommodation for couples, families as well as for weddings the Castaway Island is one of the most popular Fiji islands in the Mamanucas. All of the island bures are equipped with king beds, vaulted ceilings and air-conditioning, as well as being just moments away from the beach and the clear, blue waters of the lagoon. Castaway Island has a range of excellent facilities including a great restaurant and bar where you can relax with a meal and a drink whilst watching the magnificent sunsets. There are also a number of fun and exciting activities that holiday makers can enjoy while staying on Castaway Island. 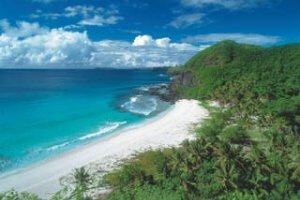 The Yasawa Islands are a group of about 20 volcanic islands that lie of the north west coast of the main Fiji island of Viti Levu. The Yasawas (as they are affectionately known) are home to some of the most beautiful islands with pristine beaches that you will find anywhere in the world. There are 4 main islands in this archipelego, Yasawa, Nacula, Waya and Naviti, as well a number of smaller islands. The islands have only recently been opened to tourism and as such they provide the ideal destination for a romantic island getaway, exotic wedding or honeymoon, relaxing holiday or excellent beach accommodation for the entire family. 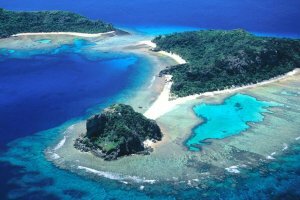 One of the most luxurious islands in the whole of Fiji is Turtle Island. 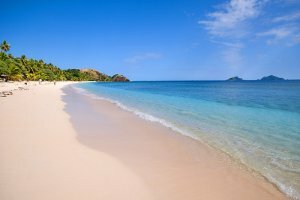 It is ideally positioned in the heart of the Yasawa group of islands and is a 5 star tropical island paradise that yout will never want to leave. Turtle Island is 500 acres in size, is surrounded by blue lagoons and contains numerous secluded beaches where you can be alone with the one you love. With such a beautiful island combined with luxury resort accommodation, fine dining, friendly staff and an array of holiday activities Turtle Island is the perfect place for honeymooners or couples who are looking for a romantic holiday.